The Latest Two Solution Spot Welding Machine. The realization of demonstrable welding quality. ✔　Welding strength with safety a priority. ✔　Clearing manufacture approved welding standards. ✔　Elimination of human error. Compensating for the problems that arise out of high performance and high functionality. ✔　Ergonomically designed to be lightweight and easy to handle. Car manufacturing quality welding brought to every operator in every body shop. Yashima’s QC concept is our promise and commitment to quality control management. “ Car manufacturing quality welding brought to every operator in every body shop” commitment. With precise settings at the heart of our message, we have been attempting to spread the word about the necessity of precise parameters to achieve quality welding. In today’s world of welding, in order to overcome the trade-off between rigidity and weight saving, car manufacturers have developed and diversified materials such as lightweight composite steel and furthermore super high-strength steel. Body shops around the world are expected to have the technology and techniques to cope with this changing world, and for this? We bring you the “EZ series”. Turn something you have to do into something you want to do. The EZ concept at Yashima is our commitment to the best possible ergonomics. 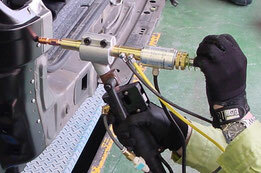 Nowadays, welding quality management in car repair maintenance is getting to be common practice. 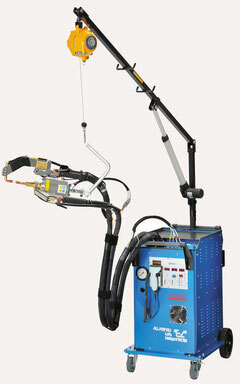 In return for high performance and high-tech functionality, welding machines are becoming heavier and harder to use. Furthermore, for superior quality welding you have to have complex and tricky welding settings as well as specialist knowledge. If, as a result, operators are making sacrifices, no matter how good the equipment is they won’t gain the full potential. We bring you the easiest, lightest, most comfortable welding machine to maximize that potential. "Turn something you have to do into something you want to do." In recent years car body materials on new models have strengthened even more. Even replacement parts have started to come with 1500Mpa class, super high strength steel on the areas to be welded. 760daN, clearing the minimum welding requirements set by all car manufacturers. In order to provide these specifications with stability, over 95% of the electrical current path is water cooled thus enabling you to do full-scale panel repair work on any number of cars throughout the day. The EZ series control panel is not just highly visible, straight-forward, and intuitive but also comes with large buttons so you can make any adjustment even when using welding gloves and settings that are designed with the simplest selection process in mind. Just turn on, set the thickness of the base metal you are working on and that's it! When needed, you can choose the welding strength and materials. With only these simple instructions the machine first calls up the pre-programmed setting table adjusts the automatic pressure control system and the chosen welding current is corrected during the welding operation. AIR GUN and Easy Set Up System. The YA-10 gun that comes standard with the YSI-25EZ-P is designed with a priority placed on handling. 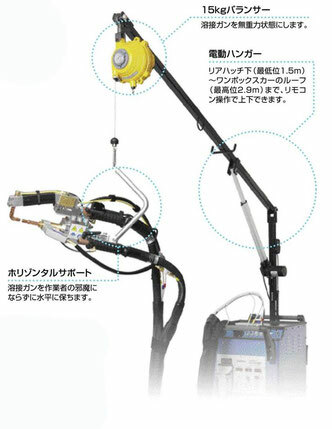 To change the arm; firstly, disconnect the water cooling line; then release the quick release lever; turn the arm 45° according to the guide, then the arm can be released. To attach an arm simply reverse the process. All of which can be done in less than a minute. Tips can also be easily changed. After changing the tip, simply apply light pressure to that tip, and it is set. Welding settings that prioritize quality control are often unreasonably difficult for the operator to understand. 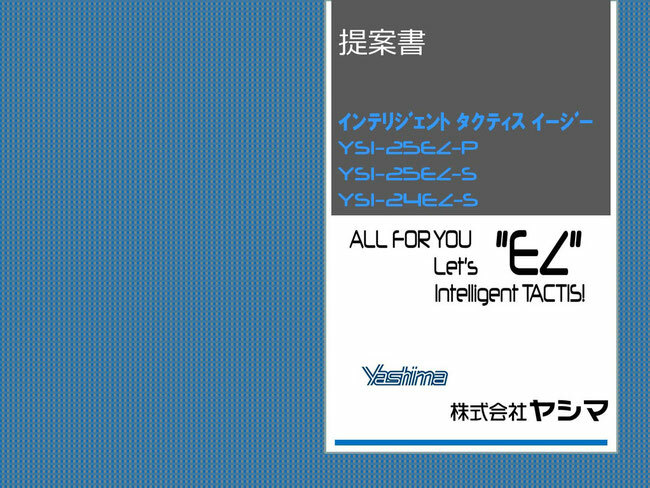 The Yashima barcode solution is the answer. A barcode book containing tables listing thickness, materials, and manufacturer recommended setting according to each car model is supplied for your convenience. Furthermore barcode labels can be printed and attached to car repair manuals or even attached to the car parts intended for welding work. The horizontal support system is made up of an electronically controlled cable hanger, a 15Kg balancer, and a horizontal supporter. That is a complete system designed to lighten your work load. Effective and efficient where relatively high strength welding is not necessary. With the EZ series, stable, high quality, single sided welding can be achieved with the unique 3 stage current setting (3C waveform made*), spring assisted water cooled single sided welding gun, and water cooled earth plate. ①First, a low welding current is used to penetrate and remove any outer layers, such as paint or anti corrosion coatings, until the gun’s tip is able to reach the base metal. ②Next, a small nugget is created on the base metal under the low welding current. ③Finally, during the main stage of the welding at a higher current, the nugget is fully developed and welding can be completed. ・Pressure applied by the operator is stabilized though a spring mechanism. The consistent pressure creates an even weld throughout. ・Each stage of the 3 stage current setting combined with the even pressure system creates the perfect welding conditions as well as hole opening prevention. By grounding, the earth plate, damage to the base material is prevented and a stable welding current can be sustained for longer periods. 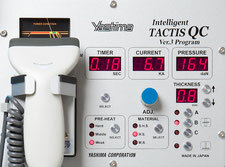 In today’s world of welding repair work, the Intelligent TACTIS EZ comes equipped with more than enough specifications and functions. This is a welding machine built for welders by welders, and is packed with ergonomic ideas to bring you the perfect machine for your body shop. The Intelligent TACTIS EZ continues our commitment to bring customers products that will provide guaranteed satisfaction for years to come.